The Turkish lira is another currency that has collapsed in recent months. Citizens of Turkey have dumped lira in exchange for dollars and stuffed the dollars under their mattresses exactly as some U.S. citizens did during the Great Depression. President Erdoğan has taken a slightly different approach than India, Zimbabwe, and others who have declared war on cash. 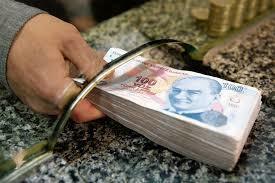 Click here to read how Erdoğan has urged his citizens to convert dollars and euros into lira and also into gold. At least gold is real money and exists outside the digital monetary roach motels run by the banks. Erdoğan is more comfortable with gold than he is with dollars. That’s another straw in the wind that reveals both the global dollar shortage and the search by developing economies for an alternative to the global dollar-based monetary system.